Results of analyses and any assertions of novel taxa or functions may not be meaningful if an out-of-date reference taxonomy is used. Given the rate of change, taxonomic reference files more than one year old should be re-annotated prior to use. George Garrity will be delivering a seminar on Tuesday, regarding observations on the impact of rapid changes in prokaryotic taxonomies and nomenclature. This talk highlights recent findings in taxon calling and strain classification based on NamesforLife data. 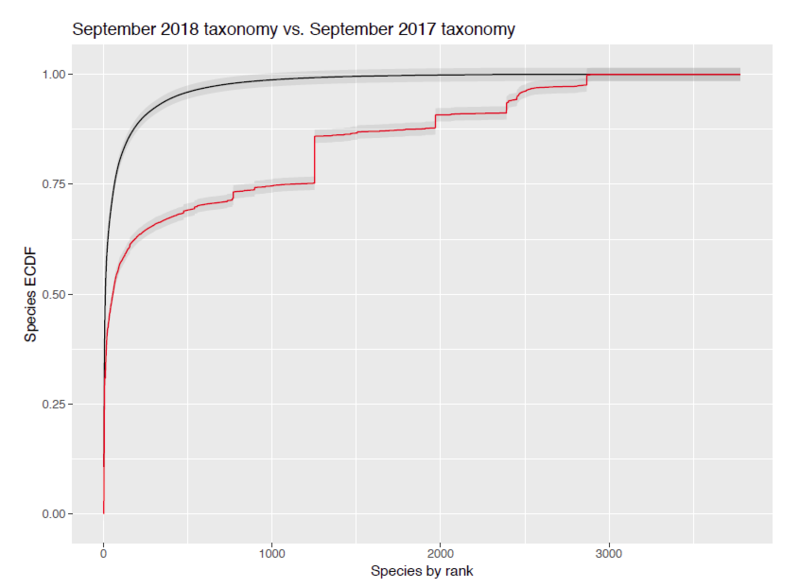 Changes in the prokaryotic taxonomy over eight months incur statistically significant changes for some test metagenomes. [permalink] Posted October 16, 2018.